Biography cannot explain talent. Knowing a person's childhood details and early life may be interesting, but it does not (and cannot) illuminate the talent itself. Some piece will always be missing. This seems to be the attitude that Sophie Huber has taken in her meditative documentary, "Harry Dean Stanton: Partly Fiction," about the great American actor. Stanton is 86 years old. He is still working. He has been in over 200 films, and even he doesn't know the exact number. He was born in Kentucky. Beyond that, we don't get much from him. He fought in the Battle of Okinawa. He was maybe married for two weeks once, he's not sure now. Sophie Huber is faced with a wall of gentle resistance to her questions. And yet, as he does in his roles, Stanton opens himself up to the camera in a way that has the indelible stamp of truth, an almost fragile sense of honesty. At one point, in his car, he says to Huber off-camera, "I don't want any lines. How 'bout doing nothing? How 'bout silence?" Although the film is filled with talk and music, it is the silence that opens up our understanding. Rainer Maria Rilke wrote, “Do not now seek the answers... Live the questions now...” Harry Dean Stanton, reserved, elusive, carries around his solitude with him wherever he goes. He is a man who "lives the questions". The answers are irrelevant—to Stanton, and to this film. 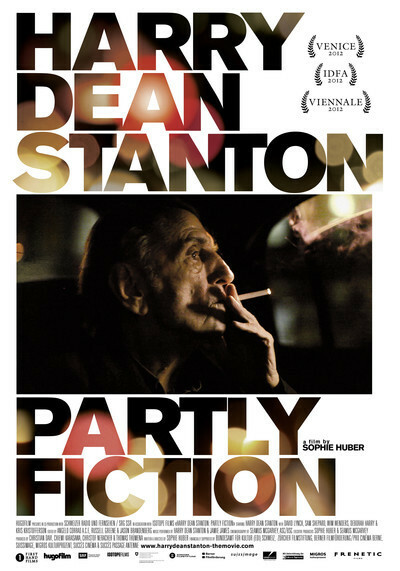 Harry Dean Stanton: Party Fiction" takes a dreamy and philosophical approach, reflecting the personality of the man who is its subject. It is partly a day-in-the-life-of-Harry-Dean. We drive around the empty night streets of Los Angeles with him, we go hang out at a bar on Santa Monica Boulevard, where he has been a regular for 40 years. There are brief but fascinating interviews with colleagues and friends, Wim Wenders, Sam Shepard, Kris Kristofferson, Debbie Harry. There's a wonderful scene where David Lynch reads questions to Stanton about his life from a piece of paper. Clips from Stanton's movies are, surprisingly, few and far between, and seem relegated to the films discussed by those interviewed. Interspersed throughout is footage of present-day Harry Dean Stanton sitting in his Los Angeles home, singing the songs that he loves, country-western tunes, Mexican songs, "Danny Boy". When he sings, he is lost to everything but the music. In an illuminating moment later with Kristofferson, Stanton expresses regret that he didn't pursue singing seriously. At first, it seems that the songs are there to add nuance to our image of Stanton, but by the end, we've heard him sing five or six songs in total, and Huber clearly finds Stanton's love of music and his openness while singing a key that accesses us to Stanton's inner world. Stanton had been working for 30 years as a character actor before he got his first lead role, as the man who appears from out of the desert in Wim Wenders' "Paris, Texas". He usually plays outsiders, loners, drifters: men on the outskirts of the cultural norm. His one brief scene in Monte Hellman's "Two-Lane Blacktop", as the lonely gay hitchhiker who puts a hand on Warren Oates' knee, is tragic, and he has less than five minutes to establish an entire story for his character. But that is just one example from hundreds. David Lynch speaks of Stanton's "innocence", which remains intact despite his age and experience. Perhaps his career of playing outsiders is partly an accident of genetics: his face is one of the most memorable in cinema, etched with lines and deep crevices. Sam Shepard says, "He's one of those actors who knows that his face is the story." Stanton's eyes always seem to be looking at a horizon, either actual or interior. He is powerfully elsewhere. Pain wells up in him easily, coming in a breath, a pause. He does his work simply, with no fanfare. To quote Katharine Hepburn on John Wayne: "He is a very very good actor in the most highbrow sense of the word. You don’t catch him at it." Stanton admits that he has always been "a loner", and yet he has maintained friendships over the course of his life. He and Jack Nicholson are very close. Stanton tells of his friendship with Marlon Brando, the long phone calls they would have in the last three years of Brando's life. Stanton has no sense of self-importance, or awareness of his status. When David Lynch asks Stanton how he would like to be remembered, Stanton replies, "It doesn't matter." You believe him. One of the problems for actors who make it look so easy is that they are taken for granted, by the industry and by audiences alike. Stanton has not been nominated for any major awards. He has remained under the radar for nearly 60 years. It seems he likes it that way, but his assistant, Logan Sparks, adds a refreshing contradictory opinion. Sparks says, of Stanton, "He always says 'Do nothing'. If he actually 'did nothing', he'd still be sitting in a rocking chair in Kentucky." It's a fair point. People may drift into one or two good roles, or a good five-year run of movies. One does not "drift" into a 60-year-long career. It takes gumption, ambition, and commitment, all words that seem anathema to Stanton. When Harry Dean Stanton was fourteen years old, he was home alone, and he became so conscious of "the void", of the nothing-ness at the heart of existence, that he called up his aunt to "to see if [he] was still connected." Facing the void, or, more accurately, living with the knowledge that the void exists, is at the heart of Harry Dean Stanton's personality, and his work as an actor. Sitting in the back seat of a car during one of his nocturnal jaunts through Los Angeles, he mentions that when he thinks of how fast the earth is going around the sun it makes him nervous, because "there isn't anything I can do about it." He looks out at the dreamy nightscape of Los Angeles from Mulholland Drive and muses that all of this is temporary, the universe will end someday, death is a part of life. "And that's not a negative concept," he says. "It's just what is. It's liberating."